You know, I've tried and tried, but I haven't been able to make contact with my inner diva ever since I got in touch with reality. Perhaps when I grow to be the eccentric old woman I hope to be one day I'll find her. I think you just need a little jump start. 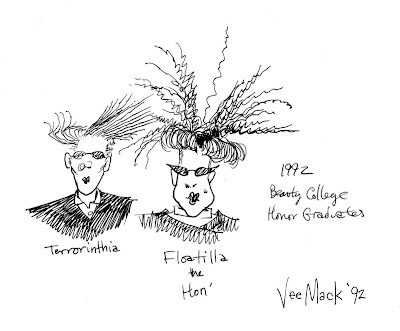 Go to a beauty college where you can find some gifted student like Terrorinthia or Flotilla the Hon' - students who are pressing the envelope of aesthetics (or BURNING the envelope of aesthetics) and let them experiment on you with the latest 'beauty' novelties. I'm sure that once you see their handiwork your inner diva will burst right out of you!